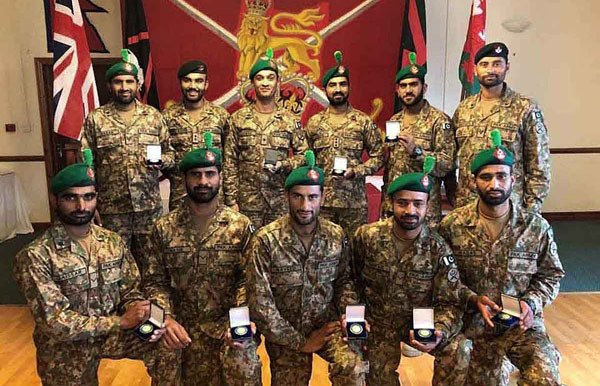 RAWALPINDI, Oct 20 (APP):Pakistan Army team won gold medal in “Exercise Cambrian Patrol”, held in United Kingdom (UK) in the second of week of the ongoing month. A total of 131 teams from across the world armies participated in the event, known as one of the toughest patrolling test for military personnel, said a statement issued here by Inter-Services Public Relations (ISPR). Cambrian Patrol is physically challenging and arduous exercise which concentrates on teamwork for achieving the mission held in the most unforgiving mountainous terrain of mid-Wales, UK, amid tactical and technical challenges, testing leadership, self-discipline, courage and determination of the participants. This is the fourth time Pakistan Army has won Gold in the Cambrian Patrol winning the competition last year as well.